Owls are creatures of shadow — both the shadows of trees in a darkening forest and the shadows of misremembered tales retold by forgetful minds. Mice tell a myth of fearsome creatures with scaly talons, massively muscled bodies, and sharp, hooked beaks. Death from the sky, instant death, for any mouse foolish enough to be above ground when these creatures come hunting. The name of the myth is owl, and few mice see one and live to tell the tale. Owls are creatures of shadow — both the shadows of trees in a darkening forest and the shadows of misremembered tales retold by forgetful minds. My name is Randal, and I am a mouse who has seen an owl up close and lived. My story is not second-hand, nor is it misremembered. For every moment of that night is burned into my brain with the mortal terror that coursed through my body every second that I was in Nocturnia. How did I survive? I did not go to Nocturnia as a mouse. I am an inventor, and before my voyage to Nocturnia I built many small conveniences for the mice of my village. Doors that hinge and lock; a pulley-drawn elevator that carries mice up to the bountiful branches of our village’s oak trees; a powerful vice that crushes acorns into a tasty mash. Yes, the mice of my village were happy with me. Then I began work on my machine. I scavenged the supplies from a brown dumpster across the concrete lot that all the other mice in my village avoided. There was never any food in this particular dumpster; however, I’d found many useful materials there for my inventions. Then, one day, among the scraps of wire and broken slats of gray plastic, I found some old green boards, dotted with colored knobs and traced with lines of silver. I was enthralled. There was energy in those boards that made my paws tingle as soon as I touched them. I knew they were magic, and I needed to harness that magic. Much to the consternation of my fellow villagers, I stopped answering their requests to construct minor doodads — toys for their children, more efficient cooking tools, and the like — and devoted myself full-time to building a machine that could uncover and test the powers of the magical green boards I’d found. My experiments were exhausting and produced strange results. One board reversed my sense of taste and sight when I hooked myself up to it with a wired-up skull-cap I’d built from a thimble. That was a strange experience. Undaunted, I began wiring the boards together, adjusting the locations of the colored knobs, and, all the while, keeping detailed, ever so detailed notes. One by one, the mice who used to call on me stopped visiting my laboratory. I suppose that rumors must have spread, flying wild as rumors are wont to do. I did not care. My studies were far too fascinating to concern myself with the uneducated fears of my fellow villagers. What did they know of the wondrous twin powers of magic and science? Eventually, I could reliably swap my consciousness with that of an ant who lived in my lab and cooperated with my experiments in return for bits of sugar and candy. Like me, Brielle was a social recluse, an outcast from her anthill, disavowed by her queen for heretical thinking. Unlike me, she could not return to her society. I suppose I could have thrown my work away… Given up my anti-social tendencies, scorned the dark sciences that were making the other mice frightened of me, and rejoined the happy society of rodents living between the hawthorn tree and two oaks. I did not. And the discoveries I have made since have opened my eyes to an indescribable vastness of experience. I can no longer go back. When I found the owl feather in the concrete lot, fate’s dark hand moved my paw. It was small and downy to the touch. Slips of silk, sewn together into one thin spine, drawn down to the sharp point of the quill. Trace of my enemy. The signature of death. Yet, I grabbed the feather and clutched it to my heart, scurrying all the way back to my lab. I had been possessed by an idea, body and soul. A dangerous idea. My paws moved without me to wire the feather into the machine of green boards. My mouth moved against my will, describing my plan to Brielle. As she listened, she bowed her head, compulsively cleaning her antennae with her forelegs, denoting her clear nervousness. But I pressed hard, for my plan would not work without her assistance. And, heaven help me, Brielle gave in. The cage I constructed for myself was built from a cheese grater. I firmly wired extra panels to the top and bottom. The panel on the top was spring-loaded, but the latch only worked from outside. Working the latch: that was all Brielle had to do, wait out the night and open the latch for me. She left my lab after that night. I wonder where she went. Where does an outcast ant go? I fed wires through one of the holes in the cheese grater, connecting my thimble skull-cap and a portable power switch to the machine. When the time came, I crouched inside the dark, claustrophobic cheese grater. The only light there streamed in through the tiny holes. Brielle watched me, her antennae stenciling tiny circles in the air, as I put on the skull-cap. I held the power switch in my paws. My ant and I stared at each other through the hole. She held my gaze as I steeled my nerves. I threw the switch, and my paws were gone. I had wings. My god, it had worked. Dizziness and elation filled me as my new broad, strong, feathery arms swept back and forth in rhythmic strokes. My talons curled, tucked tight beneath me. Beneath me! Alack! It was as if the entire universe had turned upside down, and the endless night sky stretched nauseatingly away… beneath me. I faltered. Realizing the power I’d assumed in a moment by stealing a flying body, I lost the power, broke the rhythm, and, thrashing, truly fell. The next part is hard to remember. In retrospect, I find my mind rests more where it is used to… In this old mouse’s body. The visceral feel of flying, forgetting how to fly, and re-finding it again mid-fall eludes me. It is a sensation shaped wrong for this mouse brain. Instead, I wonder how the owl, in those first moments of being robbed of his usual self, railed against the cheese-grater cage. Did he scream? Did he claw? Did he try to tear out his own, foreign limbs? My limbs. How must it have been for Brielle to watch me… but not me… gripped by an insane rage? Did I threaten her? I know it was bad, because she wouldn’t speak of it. But, I must admit, while I lived in that owl’s body for one night, I was far too lost in my own experience to spare a single thought for the body I’d left behind or the friend I’d left guarding it. I did fly to the owls’ city. Following my new winged brethren, I found my way deeper into that forest than my mouse legs could have carried me in many days. I circled the sky, hearing the shrieks of other owls. “Nocturnia!” their voices rang. My head rang too. Even clothed in my wolf-body, the idea of infiltrating owl society terrified my little sheep-self to the bone. “Join me,” the voice of death chittered near my ear. My heart leapt in terror, but my wings stayed steady. The voice belonged to a she-owl, and my sight of her was the first clear sight I ever had of an owl. For, though I inhabited one’s body, I could not see myself, and the other owls I’d seen were the same feathered bolts of death in the distance that I’d glimpsed as a mouse. Only now, I shared the sky with them, instead of peering up at them above. My beak and voice felt strange to me, but I managed to hoot a hoarse, “Yes.” She angled her wings and swooped ahead. I followed her, and she led my way, wending between the trees, to a building nestled in a giant oak’s upper branches. The building was a splash of clashing colors in the dark of the forest night. The roof was constructed from overlapping umbrellas in red, yellow, blue — all settled in the natural architecture of the trees. The walls were more muted tones but even more riotous in pattern — patchwork quilts with all their little triangles and squares, draped down from the umbrellas’ edges. The she-owl and I lit on a branch and side-stepped our way between a gap in two quilts. The space inside was complex, riddled with the umbrellas’ hanging handles and the tree’s snaking branches. Stolen road signs — red octagons and green rectangles — were arranged as tables, and many owls perched around them, hooting and cooing conversationally. I thought she was going ask if I minded whether she ate in front of me, but she must have picked up my unconscious body language. “Why are you fasting?” she asked instead. “Out of respect for voles. And mice,” I said. There was a hint of challenge in my voice, and I expected her to laugh at me. That would have been an experience to carry with me all my days… Death laughing in my face. Instead, she stared at me with eyes round as the moon and gold as the sun. For a moment, I forgot myself and thought I was a tiny mouse before her. About to be eaten. In that frozen terror, I couldn’t help but notice how beautiful the face of death was… Brown flecked feathers ringed her eyes in ever darkening circles, meeting at a V that extended from her hooked beak upward into ear-like tufts. She was a horrible vision, but beautiful nonetheless. Speechless, I remembered myself again. I was an owl. Apparently a handsome one, as this goddess of death was courting me. Not preparing to assault me. “Barn owl,” I answered, wondering how much more damage I could do to owl society in their city than I could here. So we soared together, through the deepening night. I marveled at the mental and physical acuity that I continued to feel as I followed her. The brain and body I inhabited felt well-rested and strong. I knew when I returned to my mouse body at the end of the night, it would be exhausted and the rising of the sun would drag me unwillingly into sleep. But, what if I had thought to drug my own body before making the switch? Then I could return to a second well-rested body, even after a full night’s activity. How much more could I achieve with my life if I began to live it dually? I could rotate my normal sleep schedule. Mouse by day; owl by night. Always awake, myself, while locking one of these devil-creatures into an eternal sleep, getting my rest during the night for me. Except… I’d have to eat, in my owl form. That thought gave me pause. However, I quickly reasoned that I could switch from one owl to another, always fasting at night and leaving each owl whose life I borrowed a little weaker for the wear. I’d steal their time and leave them all slowly wasting away! Giddy from the strength of my pumping wings and the speed of my buzzing mind, it seemed a nearly perfect plan. Diabolical. Much more effective than merely attacking their city once. Tonight, I would scout the city and lay plans for a much larger scale assault, carried out — subtly — over the rest of my life. A life that was suddenly to be filled with twice as many days — half mouse days, and half owl nights. And in this frame of mind, I first laid eyes on Nocturnia. 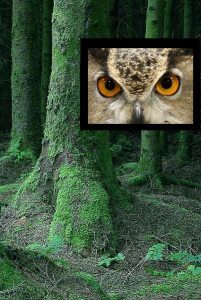 Through the dark of the night, my powerful owl’s eyes saw the forest branches grow together, twined in ways that must have taken years to train. This was not the tacky scavenger’s architecture I’d seen at the bar. This was the work of generations of dedicated arborists and craftsmen working closely with the living trees to bend trunks and branches out of their natural form and interweave them into the walls, floors, and arches of living buildings. The ancient wooden structures yet breathed with the rustle of new green leaves! I was impressed. But, my heart stayed cold and determined. I must find a way to tear down this work of art and nature, I thought. For the good of all mice. My tour began with a litany of the places that held sentimental value for my tour guide: the hollow knothole where she hatched; the branch in the ceiling of that great atrium where she perched to rest after her first hunt; that sort of thing. I hardly listened, but she didn’t notice. The tour grew more interesting when we moved on to the sites of cultural significance. We visited an art gallery filled with exquisitely delicate paintings and carved stone statues. The paintings ranged from simple portraits of owls to abstract swirls that seemed to me to relate to wind patterns somehow. The most troubling paintings, however, depicted mice, chipmunks, voles… Creatures that the owls should see as food and that I see as friends. These paintings gave me an eerie feeling, as if owls must always be watching us from the sky, observing us closely, and apparently painting our likenesses before the inevitable attack. The exhibit of statues was more confusing, and I asked the owl curating the exhibit about them. He informed me that they were on loan from a nearby colony of bats and that many of the gallery’s other visitors found them confusing as well. Apparently, they made more sense to creatures with sonar. In trade for the statues, Nocturnia’s artist community had loaned the bats an exhibit of bonsai trees and other miniature topiary. The curator told me that the topiary was proving quite popular there. Next my she-owl companion flew with me past the center tree — an especially giant gingko that had been trained into the shape of a hollow bell. Inside there were rows of branches, organized into pews. The center tree was a governmental gathering point similar in nature, I ascertained, to the church hollow under the old oak in my own mouse village. My female companion informed me that this particular owl city was governed by a democratic oligarchy which was unfortunately not in session. So, I could not see their government at work. The oldest owl elected to that oligarchy, my companion told me, was currently nineteen years old. Imagine that! Nineteen. I was an old mouse already when I turned two, and I will be an old mouse indeed if I make it to three. These owls who prey on us have lives nearly ten times the length of our own. I shudder to think of how many mice an owl must eat to keep its belly full that many years. And, yet, think of the great work that could be done… With only one more year, I could do… oh, so many things. With another ten? Twenty? It is hardly fair to have been born a mouse. Perhaps that is when my heart began to betray me. I do not know. It may have been later when we visited the fledgling’s playground. The branches there had been woven into a floor as well as a ceiling, and the young owls, still learning to fly, could safely practice their new skill. They tumbled through the air, awkwardly scuffling and fumbling as they grew used to their own wings. There was a small owlet, all fuzzy still, who made me think briefly of the runt from my sister’s first litter. Only because he was smaller than the rest, mind you. But, still, it was a similarity. Younglings have a way of pulling at the heartstrings. I think the true moment of horror, though, was in the cathedral, a structure built from a quartet of red-leafed maples, woven into one. The boughs were freshly decorated with white and yellow flowers, but there were also living vines of wisteria and honeysuckle that twisted their way along the ceiling in draping arches. The entire space was lit with the soft glow of fireflies. The adult insects had been domesticated by the owls and trained to dance among the wisteria flowers. I believe it was a church service I attended, for an owl perched in a hollow of one of the red maple’s trunks and preached to us about the importance of stewardship and proper care for the trees, flowers, insects, and all the other small creatures under the owls’ dominion. Then a choir of owls sang, and their trilling, cooing voices joined in a mass harmony that touched my very soul. I challenge you to hear that song and not lose yourself. I challenge you. I truly do. For I was lost when I heard it, and I think I shall never find myself again. My female companion led me back from Nocturnia in a daze. I could neither get the sound of the owls’ song out of my ears nor the sight of those delicately painted portraits of soon-to-die mice from my eyes. I flew with my companion to the cafe built of umbrellas, all the way flapping my wings by rote. A rote I had learned too fast. A rhythm that had too quickly grown familiar and comfortable. The mantle of power I’d borrowed had already settled too easily onto my shoulders, and my emotions waged a war within me. All my loyalty to mice said I must destroy these owls. Wreak whatever havoc I could on them. But… the sights I’d seen haunted me. My heart — my own traitorous heart — spoke of beauty and value unmeasured. A vibrant and lovely society that cared about the effect they had on my own race. How could that be? In my own eyes, my mouse life was nothing more than grist for the mill of Nocturnia’s stomachs. Yet, those stomachs were connected to hearts that loved my kind for our sacrifice. Was I the monster? Destroying owl society would be as wanton as the destruction I hoped to avenge. I perched in the umbrella cafe, beside my she-owl companion, and we listened to the poetry that had been promised. We were part of a crowd, and the poets — amateur authors, I gathered — took turns in the limelight. They perched, one after the other on one of the umbrella handles, hanging from the ceiling. They told their poems in cooing voices, espousing philosophy and waxing eloquent. My companion had grown bold through the course of our adventures that night and stepped sideways along the branch we shared, until her soft feathers pressed against mine. I felt the tip of her beak at my neck. Enough of my mouse-self was left to panic. I froze. But she only pulled at my feathers lightly, preening and grooming. She fawned over me, brazenly flirtatious, and I could only shudder. Here was death seducing me, and I thought: I will let her. I will live in this utopia forever. If I only could have. But, for all of us, the timer must run out, and mine ran out before dawn. As quickly as I’d found myself falling through the air, early that evening, I once again found myself in the small, dark space of my cheese-grater cage. My she-owl girlfriend was gone. I wonder if she noticed the difference in me, in the body I’d been wearing, when it was suddenly inhabited by a real owl again? I’ll never know. For I can never go back. Upon my return, Brielle uncaged me, and then she left, wordlessly terrified by the hours she’d spent keeping watch over the owl doppelganger trapped inside my normal mouse body. Who knows what obscenities he had screamed at her when he realized the trick I’d played on him? What threats he made? Whatever happened that night, she would not explain it. She took her pay in shards of peppermint candy and packed her few belongings. She left that very morning, her antennae quivering and her six legs stepping falteringly. Her mandibles moved as if to speak to me when she stood, finally, by the door, but she only shook her head and turned away. I think her broken heart — already damaged by the recriminations of her own queen — could not take abuse delivered from the tongue of her only friend. Even if whatever words were spoken were not truly mine. I’ve tried to continue my work, but new experiments don’t interest me. What purpose is there to toiling away futilely in this small life I live? The fur on my muzzle is graying. My days are numbered. Yet, I could still do great work if only I could focus. Instead, my thoughts return, always, to the owls and their city. Thoughts that nauseate me and make me doubt the meaning of the life of a mouse. I cannot share my thoughts with my fellow mice. Who would believe me? And those who believed my experiences would yet be unable to understand their significance and enormity. How could they, when I hardly can? More likely though, they’d simply disbelieve. Sometimes, I doubt my sanity myself. Owls cannot possibly be the gentle titans I imagined on my flight of fancy. Those beings were hardly the nightmares that stalk careless mice from the sky. If only I could go back, just once, to confirm what I saw, perhaps it would give my mind some peace. Perhaps, I could find a way to understand and reconcile that world with my own. But, no, I left the light of moral, upright mouse life once, and all too quickly my eyes adjusted to the dark. And it has taken far too long for my eyes to adjust back. If they have. If they ever will.